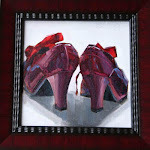 I'm almost finished my latest abstract but not quite, so I thought I'd post this painting I did a few years back. Where I live it is still cold and I am feeling rather desperate for spring. 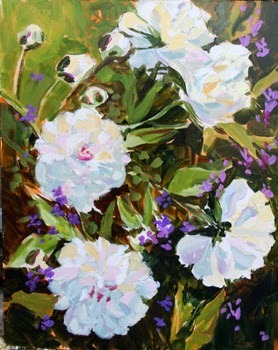 Looking at flowers helps : ) This is acrylic on masonite and is framed in a clean and classic polished black wood frame. I just went out to the car. It's cold and wet, but there's a lift to the air. Something springy is there. There's supposed to be snow tomorrow.